Use the Buy Now buttons to pay with PayPal. Easy Installation On All Collins Using The Tube Shield Interface On The PTO Tube, or the VFO jack on some. On the KWM2 both VFO and power are available on the rear panel. If you tell me what radio you will use it with, it will help me send you the best interface. The unit has two operating controls, a BAND switch, and a MODE control. All of the VFO and band offset information for many receivers is stored in the display's memory. See Radio List This allows the receive frequency to be displayed by counting only the VFO signal. Either 100Hz or 10Hz resolution is switch selectable. Each band can be individually calibrated to allow for crystals that have aged or any other error, to an accuracy of 10Hz. The calibration information is also stored in memory, so that any time you return to that band, the display is automatically calibrated. You only calibrate each band one time. The ESP DD-103 has a band that is always available for use as a bench counter. High accuracy and stability is achieved by the use of a TCXO refference oscillator. 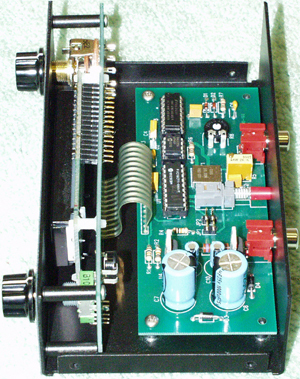 Included is a tube shield pickup for easy installation on some receivers. Others may require connecting to the oscillator section of the tuning gang capacitor. Cables are included. A power supply is included if US type power can be used. The DD-103 uses a backlighted LCD display and is 2"H X 6"W X 4"D.
We Have Connection Information For Many Radios, Email Us Your Radio Model.